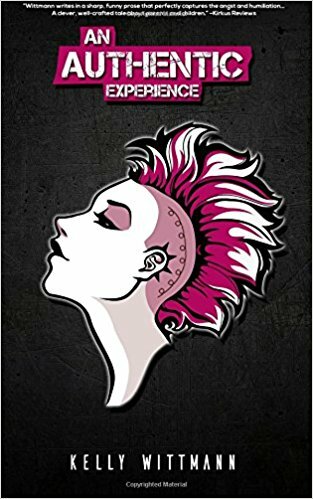 Author Kelly Wittmann is here today and we’re talking about her new contemporary young adult novel, An Authentic Experience. Kelly Wittmann is an author and educational writer who lives in Chicago. She has written or co-written 19 books. She loves reading history, doing cardio and yoga, checking out new restaurants, and watching weird, old stuff on Youtube. An Authentic Experience is about Silver, a fifteen-year-old girl whose upbringing has been unconventional in some ways, but traditional in others. When she is the victim of a traumatic experience, how will these two opposing forces influence her response? How will her relationships with her parents, her best friend, and her boyfriend be changed? I wanted to write a strong protagonist, but not to the point that she wasn't realistic. We all feel vulnerable at times. Well, the part about Silver's mother being diagnosed with a benign brain tumor came from my own experience of having one (I'm fine now). Something like that doesn't just affect you, it affects your whole family, and I wanted to explore that in this novel. Supposedly it’s against the body clock of a teenager to get up early in the morning, but Silver loved to rise before the sun to work with her grandfather at the family business, Tomasino’s Bakery. On these quiet mornings, they would roll out the dough together and bake the pastries that went on sale at 7:00 AM, under the supervision of Pope Francis, whose portrait hung on the wall. “What?” said Silver, sprinkling some flour on the dough. “What is it with the cronuts?” he said as he turned back to Silver. “I talked to a guy I know in New York who’s in the business a couple months ago and he said ‘Get ready for the cronuts. They’re coming your way.’ You know, I talk to these bakers in New York and it never fails, they can always tell me what the next trend is going to be. Used to always take almost exactly two years to get to Milwaukee. Always. But then came the internet and now everyone knows what people are eating in New York. So now it’s more like two months until it gets here!” Once upon a time, Gramps had resisted the internet with all his might, but now he loved it. He said it made doing business so much easier. My work in progress is about a high-school-age guy who sees the world through different eyes when he becomes temporarily disabled. I've always considered myself a writer, but I guess first considered myself a professional writer when my first two books arrived in the mail. Opening that box and holding them in my hands was an amazing feeling! No, not even close. Right now, I'm trying to promote this book, and that takes up a lot of my time. I no longer guilt myself about how much I do or don't write. I love writing, but there are other things in life that I love, too. Like reading, reading, and reading. Hmm... Well, I write really detailed character profiles before I start writing the book. I like to know my characters inside and out before I begin. That way, when I do begin, it flows very smoothly... most of the time. Debbie Harry. Or a writer. I want to thank them for taking an interest in my book and in what I do. Follow me on Twitter and I'll follow you back! Read my book and tell me what you think! Thanks so much for having me, Lisa!